Some great aquatic-themed slots have graced the online world for years, whether it's Microgaming’s outdoors-themed Alaskan Fishing slot or Playtech’s fun fish-themed game, Fish o’ Rama to name just two. Not wanting to be left out, slot developer NextGen Gaming have arrived with their 5 reel, 20 pay-line adventure slot, Dolphin Reef. With betting starting at just $0.01, there's plenty for even the most recreational of sea-faring guys and girls to enjoy. 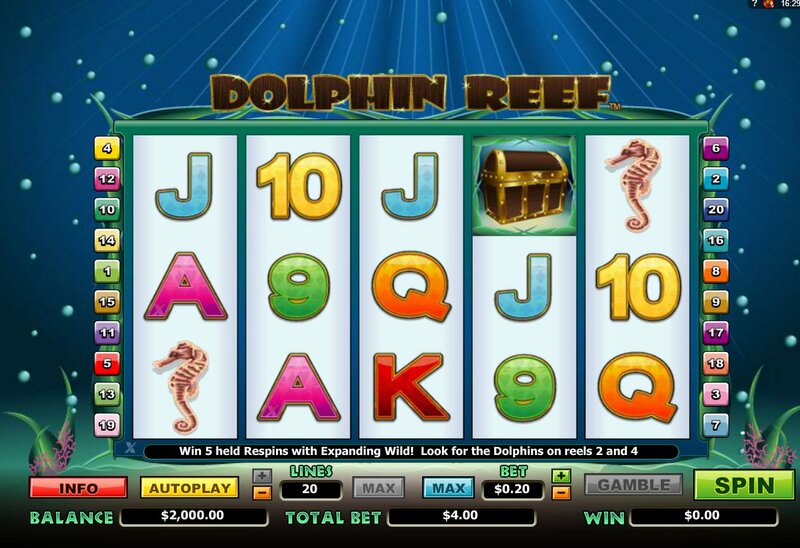 The ocean theme on the reels features plenty of aquatic wildlife, with clownfish, starfish, seahorses, sea turtles, treasure chests and dolphins filling the game screen. Making up the symbols are plenty of brightly-colored 9-through-Ace poker symbols. The dolphin icon, as you’d expect, acts as the game’s Wild, substituting for all regular symbols other than the Scatters. Not only that, when they appear they expand to fill the entire reel, adding up to even bigger wins. You Can Win 5 Free Spins and 5 Re-Spins! But we’re not done with Wilds there: if an expanding Wild appears on reels 2 and 4 simultaneously, you’ll bag 5 free spins, and the Wilds stay expanded for the duration of the games, meaning that reels 1, 3 and 5 re-spin. You’ll also see a neat little dolphin animation on the reel spots to accompany your expanded win - perfect for fans of cute little Flippers doing their stuff on the reels. 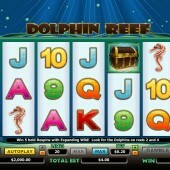 Aquatic-themed slots are as plentiful as the fish stocks in the Atlantic - at least, until they disappear altogether - but luckily slots players are spoiled for choice in 2013. I'm a sucker for expanding Wilds in slots, and I found them to hit reels 2 and 4 quite a lot, even though at first glance hitting them simultaneously may seem like a tall order. And although five free spins seems a little stingy, the sticky Wilds during the bonus round can lead to some tasty, regular extra wins.